Try this pattern in a rainbow of colors!How about all orange for a Halloween Lantern or red and green for Christmas? The possibilities are endless. JOINING WITH SC: When instructed to join with sc, begin with sl knot on hook, insert hook in st or sp indicated, yo and pull up a loop, yo and draw through both loops on hook. popcorn (pc): Work 5 dc in st indicated, remove loop from hook, insert hook in first dc, pick up dropped loop and pull through dc. Rnd 2: Ch 3, dc in same st as joining, pc in next dc, * 2 dc in next dc, pc in next dc; rep from * around; join with sl st to first dc. Finish off and weave in ends. Rnd 3: With right side facing, join Green with sl st to same st as joining, ch 3, dc in same st, * dc in next dc, dc in next pc, dc in next dc, 2 dc in next dc, ch 2, 2 dc in next pc, dc in next 2 dc, dc in next pc, 2 dc in next dc, ch 2, 2 dc in next dc, dc in next pc, dc in next 2 dc, 2 dc in next pc, ch 2, 2 dc in next dc; rep from * around, ending to correspond, ch 2, join. Rnd 4: Ch 3, dc in same st as joining, dc in next 5 dc, 2 dc in next dc, * ch 2, 2 dc in next dc, dc in next 5 dc, 2 dc in next dc; rep from * around; ch 2, join. Rnd 5: Ch 3, dc in same st as joining, ** pc in next dc, * dc in next dc, pc in next dc; rep from * twice, 2 dc in next dc, ch 2, 2 dc in next dc; rep from ** around, ending to correspond, ch 2, join. Finish off and weave in ends. Rnd 6: With right side facing, join Yellow with sl st to same st as joining, ch 3, dc in same st, * dc in next dc, dc in next pc; rep from * 3 times, dc in next dc, 2 dc in next dc, ch 2, 2 dc in next dc; rep from 1st * around, ending to correspond, ch 2, join. Finish off and weave in ends. TO JOIN MOTIFS: With right sides facing, (wrong sides together), working with 2 motifs and through both thicknesses, join Yellow with sl st in ch-2 lp, working in back loops only of both motifs, sI st in next 13 dc, sl st in next 2 ch, sl st in next 13 dc. Finish off and weave in ends. Join 3rd motif to 2nd motif in same manner, leaving one dc section free at top and lower edge of each motif. Join 3 more motifs together in same manner, joining opposite side of 6th motif to side of 1st motif to form circle. 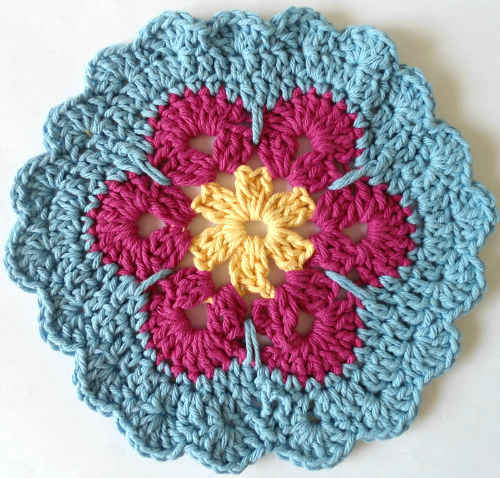 Place a motif in top opening and crochet together with sl sts, matching each dc section. Place last motif in position in lower opening and finish in same manner. RING: With Yellow, ch 23, sl st in 2nd ch from hook, sl st in next ch across. Finish off leaving long end. – Using long end, sew to holder as illustrated. 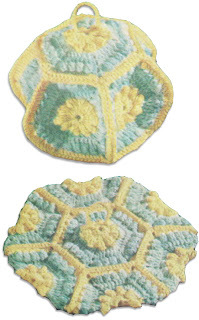 Never seen a potholder like this one, it´s 3D! Wow! Loved it! Thank you so much for sharing. This is adorable. 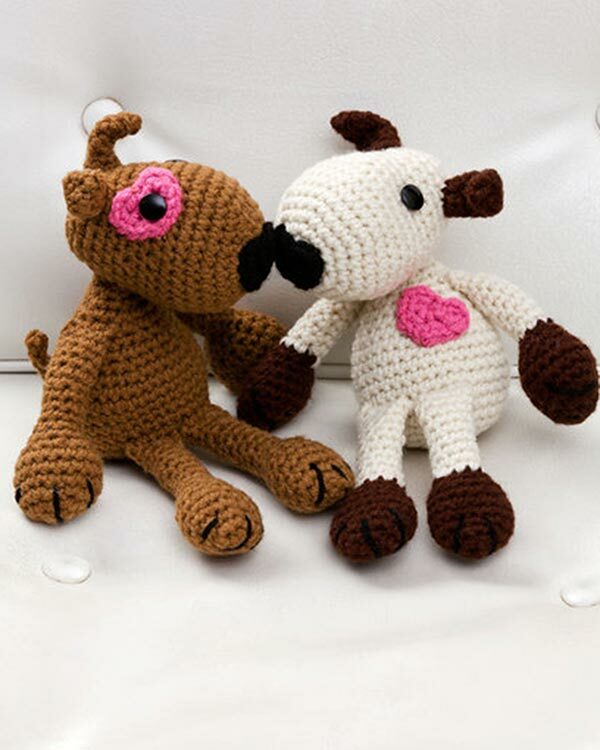 Hope to make some for Christmas. You have a really neat and creative mind. Thank you.